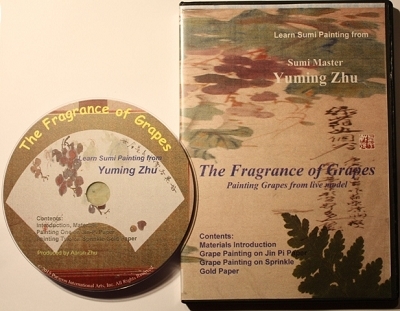 Instructional video lesson by renowned artist Yuming Zhu. He demonstrates the Sumi expression style of painting Grapes from live model. First he paints the traditional way, explaining his strokes. Then he does his own expressive version. For those of us who have only taken a few classes from him and haven't been able to really study with him, this will be interesting. It's the next best thing to taking your own private lessons! "Yuming's approach is so unique and different that the traditional that we normally see. Each time I view and listen to the DVD, I learn something new. It speaks to you at so many levels." -- Charly Stecher. Total of 2 painting demos.Painting on Jin Pi paper, and Painting on Sprinkle Gold Paper. Approximately one hour..
Copyrighted by Paragon International arts. All Rights Reserved.